The Deputy Ambassador at the French Embassy in Ireland has paid tribute to the hundreds of firefighters who fought to save the cathedral. Lionel Paradisi-Coulouma said the cathedral holds a significant place in the hearts of French people. Speaking on RTÉ’s Morning Ireland, he said the "Lady Of Paris" has been a witness to French history, and that it is important in such tragic circumstances to share a message of hope. "The feeling of shock, absolute shock. Notre-Dame has such an important significance for us. It's the cathedral of all French people, even those who have never visited it." 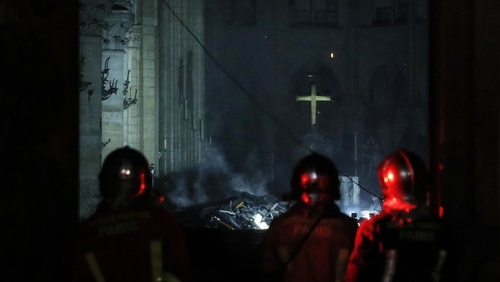 The main structure of the cathedral is still intact, and he said the effort of hundreds of firefighters contributed to that. "It was marvellous and impressive work by almost 500 firefighters yesterday and during the night, to fight against this terrible fire at Notre-Dame. The main structure was saved." Mr Paradisi-Coulouma thanked the Irish people for their solidarity, and said the French people are thankful for the messages of support from around the world. Ireland’s Ambassador to France Patricia O’Brien said the country is mourning the loss of Notre-Dame. She said Notre-Dame is not just a great iconic building in Paris, but the soul of France. She added that people were grieving today, but there is also relief that no one was killed or injured last night. "This is a terrible tragedy. France is mourning her loss today. We share her grief. Last night we wept, honestly, for Notre Dame. "Notre Dame embodies 850 years of French history. Notre Dame is not just the great iconic treasure of Paris, she is its heart and its soul." The Ambassador said she had no doubt that Notre-Dame would be restored but it would take some time. "One thing that is very, very noticeable this morning is the absolute and resolve of the French people - manifested by President Macron's statement - that the cathedral will be re-built. And I have no doubt of his determination to start the re-building immediately." Pope Francis is praying for French Catholics and the Parisian population "under the shock of the terrible fire" that ravaged Notre-Dame. Vatican spokesman Alessandro Gisotti said on Twitter that the pope "is close to France" and that he is offering prayers "for all those who are trying to cope with this dramatic situation". Earlier, the Vatican expressed "shock and sadness" at the fire that caused extensive damage to "a symbol of Christianity in France and in the world". A spokesperson for a think tank on religion in contemporary France – Le Centre d’Étude du Fait Religieux Contemporain - said it will take at least 20 years to rebuild Notre-Dame and make it safe again. Sophie Gherardi said the cathedral had not been maintained properly in recent years and it had been difficult to raise money to fix it, adding it was ironic that money will probably flow in now to help rebuild the Gothic structure. She said because the cathedral belongs to the French state money for repairs will have to be found from the general budget. Ms Gherardi said people were shocked at how quickly the fire spread, but if the Rose Windows and the cathedral’s structure could be saved, then the essential parts of Notre-Dame would be saved. The Chaplain to the Irish College in Paris described the scene last night as being like a "massive open air wake". Monsignor Hugh Connolly said tens of thousands of people lined the streets near Notre-Dame to share their memories and the atmosphere was largely a sense of disbelief and sadness as spectators watched the situation unfold. Also speaking on RTÉ's Morning Ireland, he said: "There were people praying, there were people singing ... but largely a sense of disbelief and sadness, and of muted resignation as people watched the flames come through that famous roof. "That very extraordinary moment was caught on television as the spire came crashing through the roof in flames." He described Notre-Dame as the living, beating heart of the Catholic diocese in Paris. Archbishop of Dublin Diarmuid Martin said that people of all faith and none are mourning the loss of the Notre-Dame. Speaking on RTÉ's Today with Sean O'Rourke, he said that Notre-Dame has stood as witness to continuity and goodness throughout history. "Notre-Dame is one of those buildings that you would say, 'if these walls could speak'. It's gone through all the ups and downs of French and European history. "All of France - Christians, Jews, Muslims and people of no faith are mourning the loss of this building." Dr Martin said the maintenance of cathedrals and churches pose a huge challenge, and he believed that something could be done in Ireland to raise funds to help the restoration of Notre-Dame. "I think we may have to find ways in which Irish people could have an opportunity to make a contribution, some kind of collection. We've done this in the past, I remember for the earthquake in the Marche region of Italy. We simply had boxes at the entrance to the church. Irish people are extraordinarily generous." Meanwhile, Britain's Queen Elizabeth has sent a message to French President Emmanuel Macron to say she was deeply saddened by the fire and that her prayers were with all of France. "I extend my sincere admiration to the emergency services who have risked their lives to try to save this important national monument. My thoughts and prayers are with those who worship at the Cathedral and all of France at this difficult time."